Friday 1st June will see people across the country celebrating their love of fish and chips as they come together on National Fish & Chip Day. 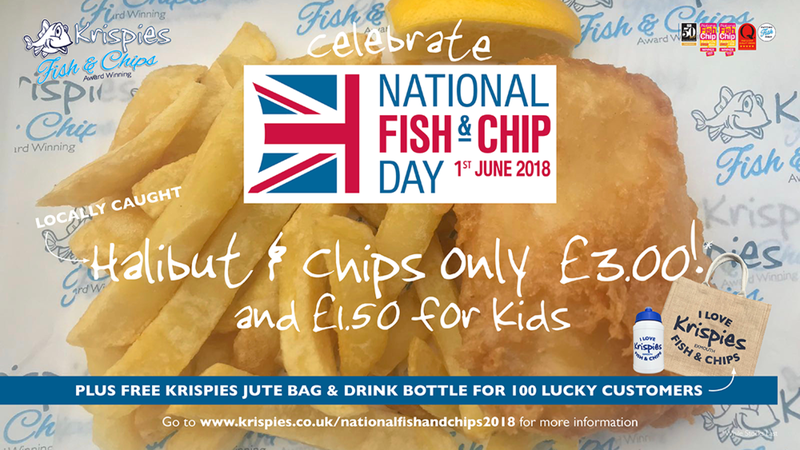 We love National Fish & Chip Day at Krispies and to celebrate will be marking the occasion by having a Fish & Chip Special which will be selling at only £3.00 for adults and £1.50 for kids. We don't know what the fish will be yet – we will have to wait and see what comes off the boats so be sure to keep an eye on our website and Facebook and Twitter to find out more information nearer the time. Not only this but the first 50 people to buy the Fish & Chip Special at 12.00pm and then again at 6.00pm will also receive a FREE reusable Krispies Tote Bag and refillable water bottle. We will also be announcing the winners of our Fish Poetry competition. We have already had some amazing entries and the winning entry will be on display in the shop for you to read whilst you wait for you freshly cooked Fish and Chips. If you haven't already entered you poem, there is still time and you can enter it here.